The theory of relativity, developed by Albert Einstein, has had as profound an impact on the world as any scientific breakthrough in history. Not only did relativity fundamentally change our understanding of the universe, but it led to new technologies that have had a lasting impact on human society. These models are all very successful in describing natural phenomena, but they each only apply to limited cases. Classical physics, also called Newtonian physics after 17th century physicist Isaac Newton, is the oldest model and the one that applies best to everyday human experiences. Classical physics describes the laws of motion and the mechanics of gravitational bodies. In the late 19th century, however, it started to become clear that the classical model was incomplete. It failed to adequately describe the behavior of light and the inner structure of the atom. 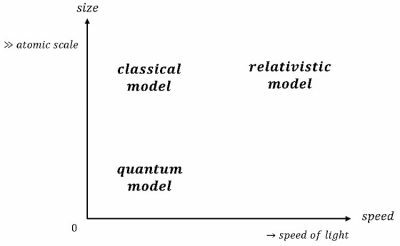 Classical physics works for cases involving scales greater than that of the atom but speeds much less than the speed of light. Quantum physics best describes phenomena on the subatomic scale but at slow speeds. 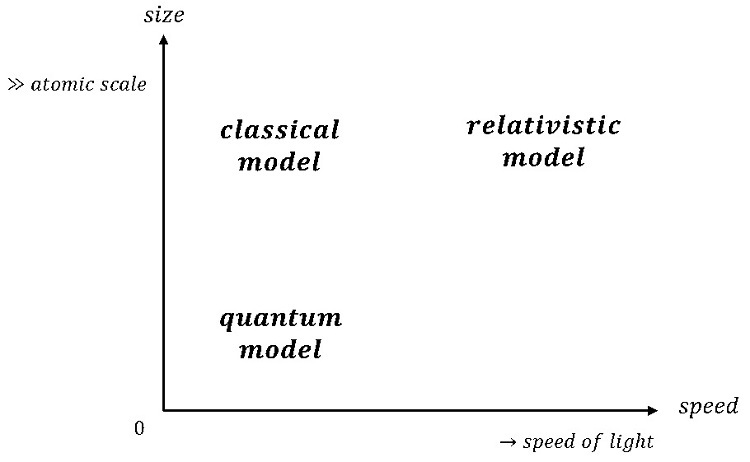 Relativistic physics applies to scales greater than the atom and speeds approaching the speed of light. The goal of modern physics study is to develop a single model of the universe that can describe all phenomena, but so far no such model has been agreed upon. Figure 1 shows the cases where the three physical models best apply. In the centuries leading up to Einstein’s breakthroughs, there were increasingly frequent debates about the nature of light—particularly the speed of light. Since light behaved very much like a wave, scientists struggled to understand how it could travel without a medium through which to move. Sound waves travel by displacing and compressing matter—so they cannot exist in a vacuum. Water waves transfer energy by water surface motion. However, light can propagate through free space with no medium to displace. Scientists assumed that the universe therefore contained an invisible medium which they called the “aether” (or “ether”). Experiments, though, always failed to detect this medium, so light remained a mystery. The laws of physics remain the same in all inertial reference frames. The speed of light is constant in all inertial reference frames. 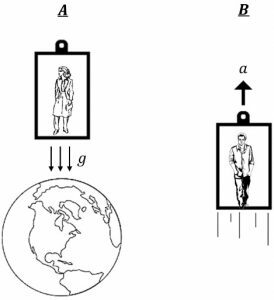 An inertial reference frame is a local coordinate system in which an observer is moving at a constant velocity relative to some other reference frame. 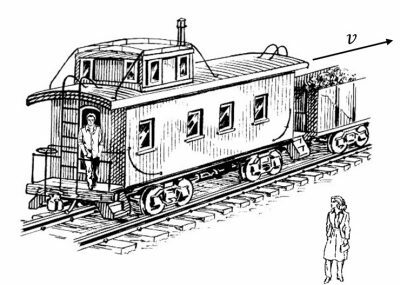 Einstein’s famous example of inertial reference frames is shown in Figure 2, where an observer on a train is moving at a constant velocity relative to an observer on the ground. 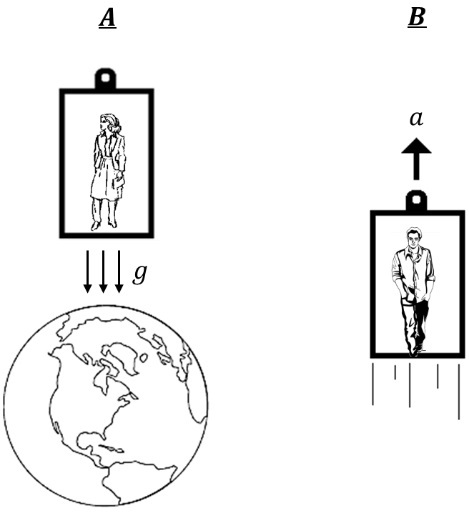 Two events that appear simultaneous in one inertial frame are separated in time in another. A body contracts in relative length as its inertial frame approaches the speed of light. Relative time slows in an inertial frame that is approaching the speed of light. Nothing can exceed the speed of light (approximately in free space). Time and space are coupled in a quantity called spacetime. Since measurements are relative to specific reference frames, physicists could do away with the notion of an aether as a medium for the propagation of light. The laws of physics remain the same in all reference frames. Thus an observer in an accelerating reference frame cannot distinguish that frame from a stationery frame that is in a gravitational field. Figure 3 illustrates the equivalence between gravity and accelerating reference frames. The observer in part A is enclosed in a box that is stationary but subject to a nearby gravitational field . The observer in part B is enclosed in a box that is accelerating upward, with no gravitational field present. Both observers will experience an equivalent downward force. The chief implication of this equivalence principle is that gravity is a deformation of spacetime. The presence of mass “bends” space and time in a mathematically predictable way, resulting in the acceleration that we refer to as gravity. The space and time distortions predicted by general relativity have been experimentally verified. The theories of relativity quickly led to advances in technology, the most immediately impactful being the development of nuclear energy. Satellite-based global positioning systems (GPS) must account for both special and general relativistic effects to operate accurately. Other sciences, from atomic physics to astrophysics, have also benefited from the theoretical and mathematical implications of relativity. The future of physics lies in the synthesis of the relativistic and quantum models into a single coherent “Theory of Everything”. 1. Which physical model applies to large objects moving at a high velocity? 2. Which is NOT a postulate of the Theory of Special Relativity? A. The laws of physics remain the same in all inertial reference frames. B. The speed of light is constant in all inertial reference frames. C. An observer in an accelerating reference frame cannot distinguish that frame from a stationery frame that is in a gravitational field. 3. What happens to the observed length of a body in an inertial reference frame as it approaches the speed of light? A. It appears to lengthen. B. It appears to shorten. Callahan, J. (2013). The geometry of spacetime: An introduction to special and general relativity. New York: Springer. Serway, R. A., & Jewett, J. W. (2019). Physics for scientists and engineers. Australia ; Brazil ; Mexico ; Singapore ; United Kingdom ; United States: Cengage.